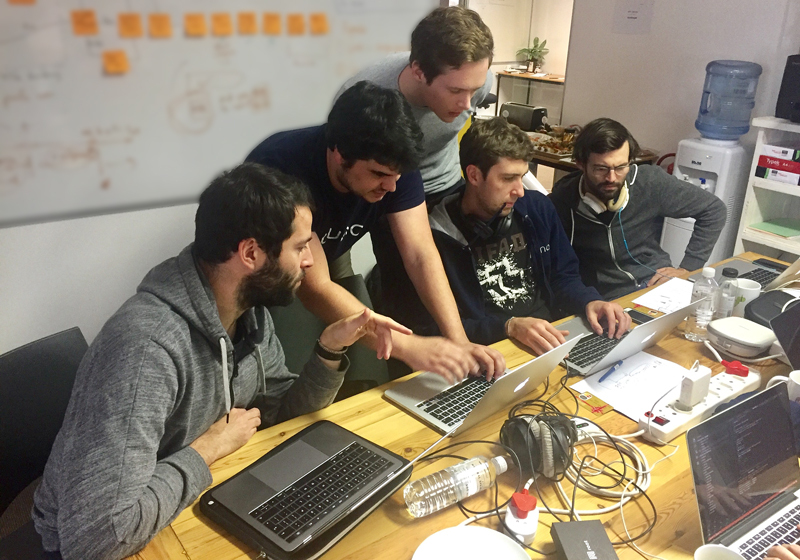 OfferZen’s mission is to help developers build great things. A big part of that is helping talented developers find jobs at companies where they can learn and contribute massively. But our goal has always been to do a lot more than that. That’s why we hosted a hackathon. We invited 12 developers to our offices and asked them to think outside the box of what they usually do. The challenge? 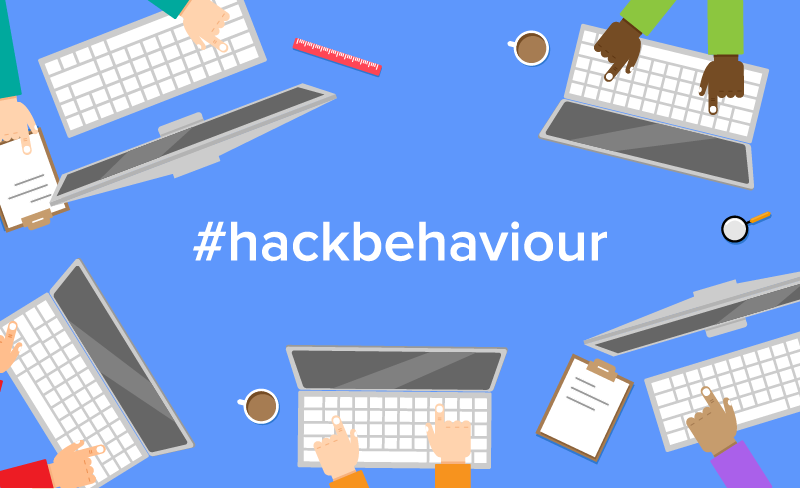 Build an app that can help people hack their behaviour. Habits are an essential part of who we are. By forming new habits or changing old ones, people can change in significant ways. Technology can play a big part in the habits we have and that’s why we challenged the participants to build something that will help people form and stick to a good habit. Research on habit formation shows that rewards are a key aspect of establishing new habits. That’s where Root comes in. Root, still in private beta, is a lightweight bank account for developers that is accessible with code. A Root account comes with a programmable bank card, online banking interface, mobile app, and APIs. Root’s cards are developer friendly, allowing a dev to write code that interacts with transactions in real-time. 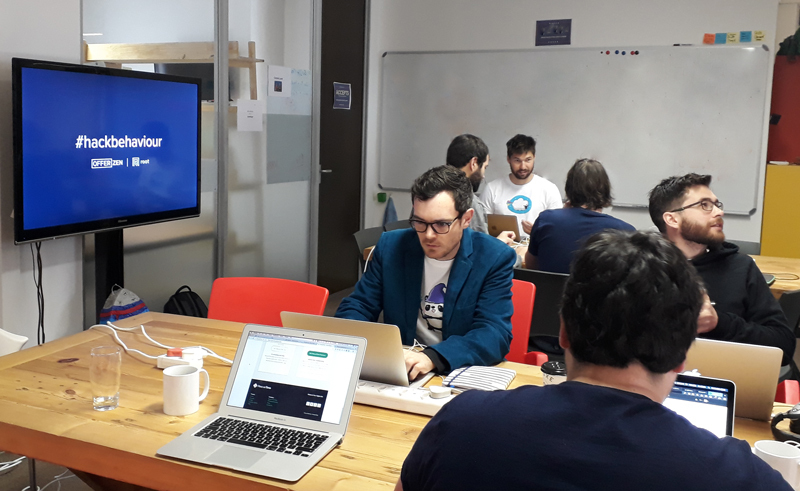 Its new Sponsored Payments API allowed the hackathon-participants to reward users of their apps with anything they fancy: free coffee, money, movie tickets - you name it. A user can enable Root apps created by developers in the same way that they would enable a Facebook app to interact with their Facebook account. When they add a new app, they can review their permissions settings and allow or deny the app access to their account. 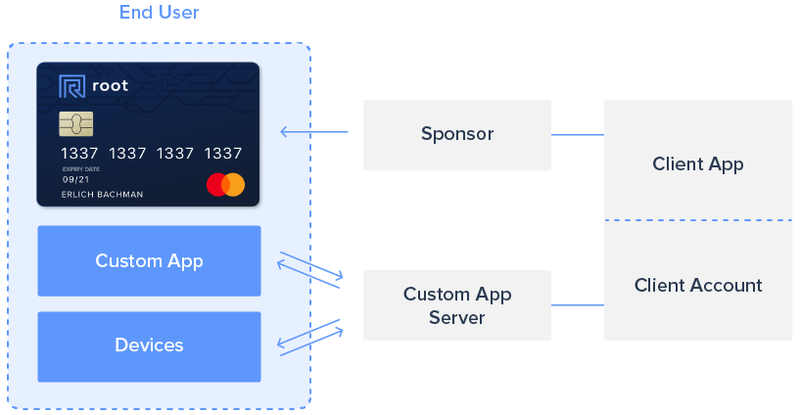 The new Sponsored Payments feature on the Root platform allows client applications to cover the cost of a user’s card transaction (or part thereof) in real-time. It’s a simple check defined in hosted RootCode: The transaction data as well as the user’s past transactions (in a black-box) gets checked in order to determine if and what amount of money should be covered by the client app owner. Open source projects can’t afford full time devs, but they can (probably) afford to give discounts on their swag. 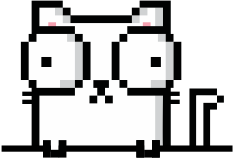 Calvin Brizzi built Wholesome Github using a Go backend and Node frontend. The app enables a Github user to receive rewards from Github project owners. “The cool thing is that it allows the project maintainers to fine tune the reward amount based on the size of the contribution’” says Calvin. “The maintainer tells the bot how much they want to reward with a simple ‘RootBot reward @username < amount >’ comment on the pull request or issue.” This way, the maintainer doesn’t have to remember who did what, or manually process rewards. Everything happens in the background. Sometimes it is hard to motivate a small team to use online kanban boards like Trello in a consistent manner. “This is a problem I’ve experienced in my software teams,” Nick Cuthbert explains. That’s why Beerdayz provides a little extra incentive: The app subscribes to Trello events. Whenever a user moves a card from To Do to Done, the entire team gets rewarded with cash to spend during their Friday social event. To ensure that the process is fair, rewards are given to the whole team but spent individually. The app also encourages team-building, as the cash-reward can only be spent on Fridays at a specific nearby hangout. “It’s a classic application of operant conditioning,” Nick says. Any given tourism industry benefits from people exploring their specific destination. Rick Kleinhans built an app called Explorer that rewards people for exploring. Players in the tourism industry (hotels, activity operators, local restaurants etc) can pay a flat rate to place a geotag on the Explore Map for a limited period of time. For every geotag a user visits, they earn Explore Points. They can then use these points to get discounts at places in the area. The rate at which an end user’s Explore Points are converted into discounts depends on the total pool of geotags in an area. Wyrd Fit incentivises people who like films to also care about fitness. Created by Co-Founder of Wyrd Films, Linsen Loots, the Wyrd Fit app rewards users with a R10 discount on a movie ticket at Cape Town’s Labia Theatre for each day they go to the gym. Kicks uses the Nike+ Run Club app to record runs. It then rewards users who have run 500km. The reward is a discount on a pair of Nike running shoes. The app checks the total distance covered after each run and incrementally adds to the discount - up to a maximum of 20% or R250. “I’m quite into fitness myself and thought it was a cool opportunity to add value to both the end user using the app and a company supplying a fitness product, like Nike,” Kiaan says. 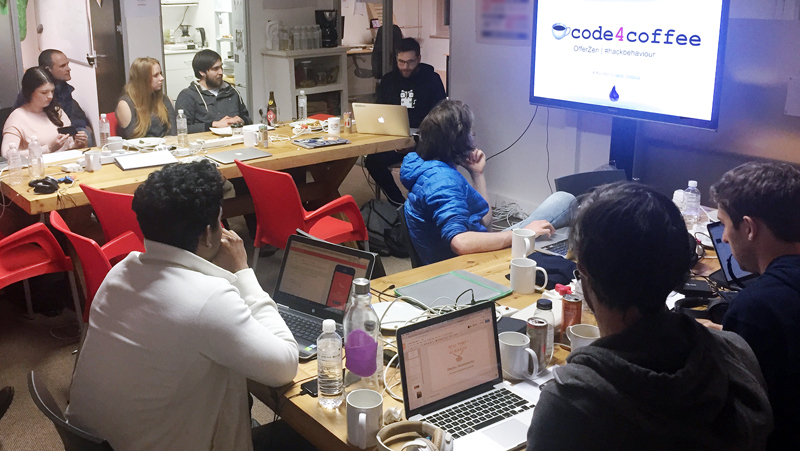 “Code4coffee combines two things I love,” Martin Pretorius says. “Programming and flat whites.” The app rewards developers who contribute to open source software with coffee: Every time one of the dev’s pull requests is merged in, they earn a free coffee at a selected coffee shop. Martin built the app in Elixir, using the Phoenix framework. The app can also integrate with the OfferZen platform to show the amount of free coffees the developer has earned. This could encourage devs on OfferZen to contribute to more open source projects. Constant Meiring and Carel van Wyk were the only participants that focused on incentivising users not to do something. The thought behind this is that rewarding people when they don’t buy “bad stuff” will motivate them to buy less of it. RealtimeRewards allows NGOs to reward good financial decisions within low-LSM communities - in partnership with organisations such as SASSA, for example. People would receive their social grants via Root-enabled cards. They will then receive rewards (or not) based on how and where they spend their money. The rewards are received in real time: When someone buys something good, they are immediately rewarded with 10% of the value of the purchase on their cards. The reward-system is designed to disincentivise cash withdrawals, alcohol and fast-food purchases by not giving rewards when the card is used for it. Additionally, consistently good behaviour can positively impact the rewards users earn as the rewards percentage depends on a long-term purchaser rating. Constant and Carel are currently testing the app with Martin and his daughter, Abigail. They’re receiving R50 per day on a Root-enabled card, while Constant and Carel keep track of their purchases.